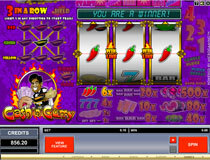 Cash n Curry is a traditional fruit slot machine that one finds in many english pubs. It has an Indian theme and many little bonuses built into it, culminating in the Curry Go Round Course which awards a top payout of 20 000. It takes a bit of getting used to, for those who have never played this kind of slot before, but once you get the hang of it, you will be entertained for hours!